Washington (CNN) - Six in ten Americans disapprove of how President Barack Obama's handling the oil spill in the Gulf of Mexico, a jump from last month, according to a new national poll. A CNN/Opinion Research Corporation survey also indicates that vast majority of the public disapproves of how BP has handled the environmental disaster and two-thirds say making a profit rather than cleaning up the spill is oil giant's top priority. Fifty-nine percent of people questioned say they disapprove of how the president is dealing with the spill, up eight points from May. Forty-one percent say they approve of how Obama's handling the crisis, down five points from last month. While the president's numbers are dropping, he still fares better than the federal government. Only one in four give the federal government a thumbs up on how it's dealing with the oil spill, with 74 percent saying they disapprove. The survey is the first national poll conducted entirely after the president's Tuesday night prime time television address on the oil spill to the American people. Obama's speech directly followed his fourth trip to the Gulf Coast since the environmental disaster began on April 20. "Americans don't like how Obama has handled the situation in the Gulf, but that has not affected his overall approval rating," says CNN Polling Director Keating Holland. "Fifty percent say they approve of how he is handling his job as president - essentially unchanged from his overall approval rating for the last three months." The poll's Thursday release comes as top BP executives testify in front of Congress. At the hearing, Rep. Joe Barton, ranking Republican on the House Energy Committee, defended BP and slammed the White House for insisting that BP place $20 billion in an escrow fund to help compensate those affected by the oil disaster. "I am ashamed of what happened at the White House yesterday," said Barton at the hearing. "I think it is a tragedy of the first proportion that a private corporation would be subjected to what I would characterize as a shakedown. In this case a $20 billion dollar shakedown." But according to the poll, Americans disagree with Barton. Eighty-two percent approve of the creating of a fund of billions of dollars to compensate workers and businesses affected by the spill. The survey indicates that two thirds of Americans think the president hasn't been tough enough in dealing with BP, with one in four saying Obama's been about right and five percent saying he's been too tough on the oil corporation. Only 13 percent of Americans approve of how BP's handling the oil spill, down 11 points from last month, with 87 percent saying they disapprove, up an equal amount from May. More than nine out of ten say BP's top priority should be cleaning up the spill, but two thirds say it's their best guess that BP's top priority will be protecting the interests of its investors and employees by making sure the company stays in business and makes a profit. 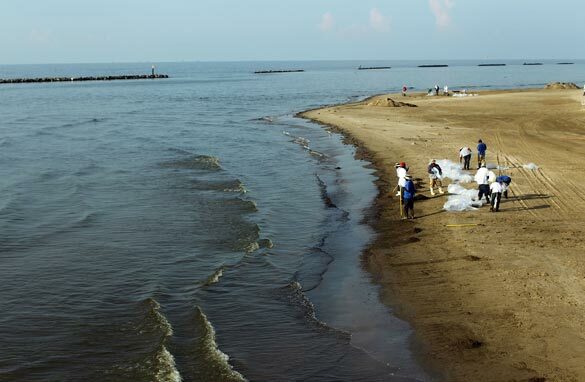 Just over one in three say cleaning up the spill is BP's top priority. Just over half questioned say they trust the federal government more than BP to improve the situation in the Gulf of Mexico, with 32 percent saying they have more faith in BP and 12 percent say they trust neither Washington or the oil corporation. "Most Republicans say they trust BP more than the government, but only about one in four independents and Democrats agree with that view," Holland says. "That's not to say that Republicans like BP - only 13% of GOP respondents approve of how the oil company is handling the situation in the Gulf and six in ten Republicans think that BP will be more concerned about the bottom line than about cleaning up the Gulf." The CNN/Opinion Research Corporation poll was conducted Wednesday June 16, with 534 adult Americans questioned by telephone. The survey's overall sampling error is plus or minus 4.5 percentage points. Obama forced BP to agree to a $20 billion escrow account that Ken Feinberg will manage; at the White House's urging, BP is suspending its dividends for the rest of the year; he forced BP to set up a $100 million fund to help oil workers impacted by the offshore moratorium; and BP is setting up a $500 million fund to monitor the health of Gulf Coast residents for the next decade.....He can't plug the leak himself people....what do you want him to do? Quit criticizing and make suggestions! MacPalin would've dug a couple of more holes in the sea and then blamed it on the gays and the liberals. That's the kinda action the teabaggers (all 10% of you) are rallying for. It is amazeing how so many people did not want goverment involved in their lives now they are crying for big goverment to get more involved!! Damed if you -damed if you don't!! You might want to actually check the FACTS before you go blustering about Obama telling countries "no" we don't need the help. As of now, there are at least 15 foreign ships in the Gulf working on the spill. Learn your facts first, nimrod. Conservative southerners have been arguing for tort reform for a long time. At first, being a good Liberal, I was opposed to capping claims for damage. I thought that sometimes corporate negligence and medical malpractice needed the fear of litigation to rein them in. But, after reading what many Conservatives have to say about it, I have changed my mind. Their arguments now make more sense to me. We Texans have capped awards for medical malpractice. Surveys show that the cost of medical care in Texas has not gone down as a result, but that is probably another Liberal lie. I realize now that every redneck in the South will be moving to the coast to get on the gravy train. I'm sure they will drink coffee at McDonald's so they can later say that their hands were shaking so much with stress over the oil spill that they spilled hot coffee on their laps. That way, they can sue both McDonald's for the coffee spill and BP for the oil spill. I read somewhere that southerners are going to the beach and pouring a can of Texaco oil all over themselves; then they fall down on the sand screaming, "The oil! The oil! It burns! It burns!" I say let's enact tort reform NOW! Cap all damage claims at $10,000. That should keep them in corn dogs and RC Cola for a month or two. After that, they can move to Arizona and pick crops. This may sound tough, but as so many Conservatives have told me so many time, "Nobody ever said life was going to be fair."